(From left) Chai, Lions District 308-A2 past district governor (PDG) Dr William Voon, SightFirst Programme chairman Dr Chan Tiang Ho, Sheila Kho from KAA together with a KAA member, and Genevieve Tan from SCCS. Du Huang and Xiao Hu perform at ‘A Night of Songs and Music’. 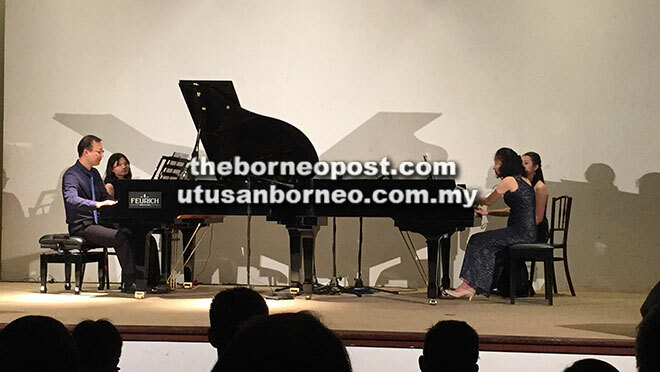 KUCHING: ‘A Night of Music and Songs’, hosted by the Lions Club of Kuching North, enthralled audience members with a top-notch piano recital by the Unison Piano Duo, as well as local voices from the Dolce Chantecleer choir. According to Lions Club of Kuching North president Norman Chai, the event aimed to raise funds for their long-running ‘SightFirst Programme’, which sees members actively engaged in preventing blindness and restoring vision to the visually-impaired. “To date, the club has sponsored over 300 cornea transplants and cataract operations,” he said, adding that in their effort to serve the community, proceeds from ticket sales and donations will also benefit the Kuching Autistic Association (KAA) and Sarawak Children’s Cancer Society (SCCS). 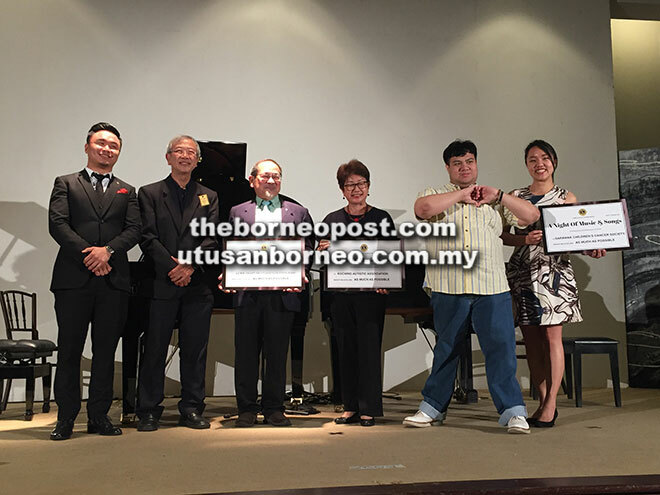 The concert raised between RM8,000 to RM9,000 in total to be shared by three groups, Chai told The Borneo Post. “On the mock cheques we presented on stage, the total is stated as ‘as much as possible’. We are still accepting donations so the final figure might rise,” he said. The concert is believed to be the first of its kind in Sarawak and featured duets on two grand pianos, performed by the world-renowned Unison Piano Duo —Dr Du Huang and Dr Xiao Hu. Both are tenured piano faculty at Luther College in Decorah, Iowa, USA, and they are in high demand as visiting professors in conservatories and schools of music in their native country of China, including Wuhan Conservatory of Music. They have performed in concert halls in Europe, Asia, and America, including Carnegie Hall’s Weill Recital Hall in New York City, Orchestra Hall in Chicago, Grosser Saal of Konzerthaus in Vienna, Salle Gaveau and Salle Cortot in Paris, Shanghai Music Hall, and Beijing Music Hall. The evening began with the Dolce Chantecleer choir, led by Sabrina Tnay, warming up the audience with ‘Rasa Sayang’, a familiar Malaysian tune. Individual members of the choir had a chance to show their vocal chops. The Quartet —Harrison Wong, Desmond Wong, Abel Law and Walter Law—gave an a cappella rendition of Elton John’s ‘Can You Feel The Love Tonight’. Boy soprano Nathan Ngu presented another familiar piece — ‘O Sole Mio’ by Eduardo di Capua. The Unison Piano Duo took up the rest of the first set for the evening. Playing a range of pieces, including ‘Concerto in C Major BMV 1061’ from Johann Sebastian Bach, ‘Norwegian Dance Op 35’ by Edvard Greig, and the ballet from CW Gluck’s ‘Orphee Et Eurydice’. After an intermission, the singers returned with more songs. Walter Law and Laura Munan took on Andrew Lloyd Webber’s ‘Love Changes Everything’, while Abel Law and Brenda Kucha sang ‘Take Me As I Am’ from Jekyll and Hyde. Chloe Soo performed Purcell’s ‘Hark the Echoing Air’, followed by a solo piece called ‘Se Vuol Ballare, Signot Contino (Le Nozze Di Figaro)’ composed by Mozart and performed by Abel. Brenda joined him onstage for her playful solo, ‘Mein Her Marquis’ by Johann Strauss. Du Huang and Xiao Hu once again returned to play another set, starting with two modern pieces by contemporary composers — ‘Etude from The Old Country’ by Terry Riley, and ‘China West Suite’ by Chen Yi. They finished off with Fredric Chopin’s ‘Rondo in C Major Op 73’. ‘A Night of Songs and Music’ was sponsored by The Waterfront Hotel, The Old Courthouse, Geosurvey Consultant, and Poppies.